We were very fortunate to meet Alexis at NASBR (annual North American Society of Bat Researchers conference) recently, where she was invited to speak. Merlin Tuttle introduced the prodigious young scientist to us and explained that one of her goals was to one day purchase our recording equipment for her work on bats in The Great Smoky Mountain National Park. Our CEO and Founder Ian Agranat was so impressed and inspired by Alexis that he pledged to gift her with her very own Wildlife Acoustics equipment for her work. 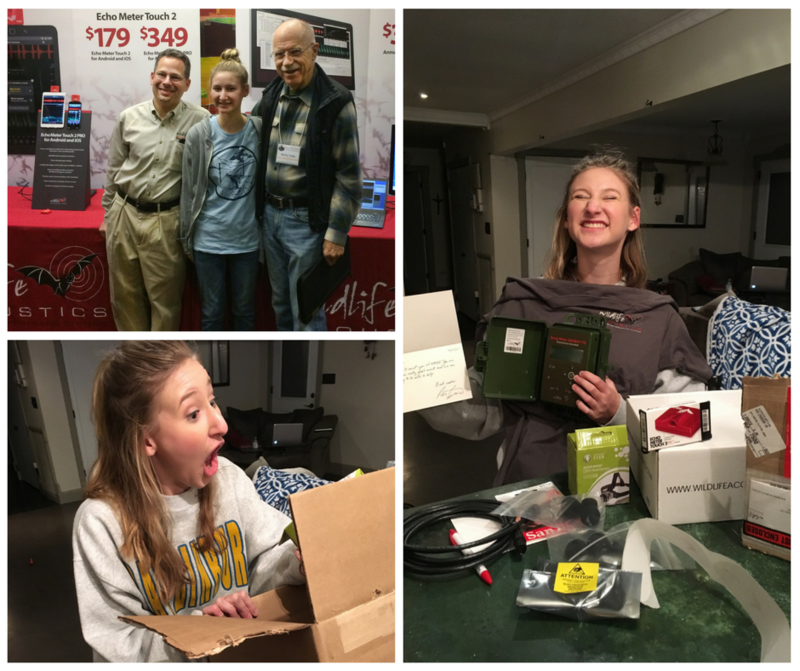 We loved seeing the look on her face from the photos her mom sent us when she opened her shipment of Wildlife Acoustics gear! Alexis will be using her new equipment in Panama as well as The Great Smoky Mountain National Park to continue her research on White Nose Syndrome, a deadly fungus killing bats in North America. We wish her luck and look forward to hearing updates on what she's doing for bats!